Wondering what you can do to keep your fuel bill low, but without buying a bland and unexciting car? Honda has an option for you. An all-new model this year, the 2019 Honda Insight is the premium compact car that just happens to be a hybrid too. Dramatic styling cues, innovative performance, and surprising bang for your buck are what you should expect with the Honda Insight, now available in Sacramento, CA at Mel Rapton Honda. There’s no need to buy a bubbly, awkward hybrid vehicle. The 2019 Honda Insight has visual appeal that draws attention for all the right reasons. Energy-efficient and extremely bright LED headlights, both high-beam and low-beam, as well as Daytime Running Lights are standard on all trim levels. While curvaceous across the fenders with deep creases for visual effect, the Insight is also aerodynamic. Exterior chrome accents, cutting-edge alloy wheel designs, and a squinty front look all catch you staring. The 2019 Honda Insight is offered in three trim levels – LX, EX, and Touring – with amazing value represented in every model. The Honda Insight LX trim includes 16-inch alloy wheels, automatic climate control, LED ambient console lighting, Bluetooth HandsFreeLink and streaming audio, and a brilliant Driver Information Interface with trip, fuel, efficiency, charge, and other information. Heated outside mirrors and an electric parking brake are also standard. The next level up is the Honda Insight EX. It adds Smart Entry with Walk Away Auto Lock, Push Button Start, a 60/40 split folding rear seat, an 8-inch Display Audio touchscreen, HondaLink, Apple CarPlay and Android Auto, and available fog lights. At the top of the 2019 Insight range is the Touring trim. Leather trimmed seats, heated and power-adjustable front seats, a 450-watt Premium Audio sound system, Honda Satellite-linked Navigation system, and mobile hotspot capability are standard equipment. As well, 17-inch alloy wheels, HomeLink, dual-zone automatic climate control, and an automatic-dimming rearview mirror are included. Lane Keeping Assist System, Traffic Sign Recognition System are Honda Sensing technologies you’ll find in all Insight models. Also, included are a Multi-Angle Rearview Camera and auto high-beam headlights, and Honda LaneWatch is standard for EX and Touring trims. If your motivation for checking out the Honda Insight is fuel savings, pay attention here. 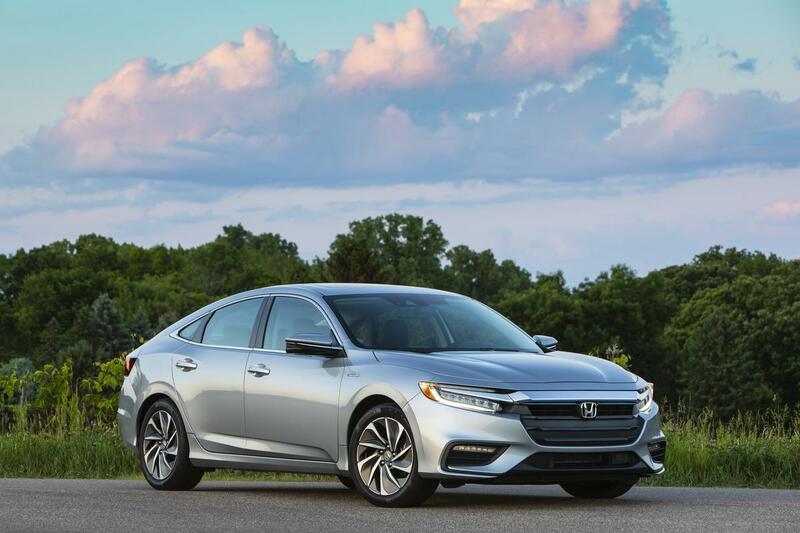 The 2019 Honda Insight LX and EX are rated for 55 miles per gallon in the city, 49 mpg on the highway, and 52 mpg combined. * Rub your eyes and check again – those numbers are accurate. You’ll be shocked how many fuel stations you can pass before you need to stop. The Insight Touring trim is nearly as good – 48 mpg combined*, so you can enjoy the best features and top fuel economy in a great-looking vehicle. It’s all due to the series-hybrid powertrain with a combined 151 horsepower and 197 lb.-ft. of torque. Paired with an e-CVT with three driving modes – NORMAL, ECON, and SPORT – and a 60-cell lithium-ion battery pack, you’ll get exciting performance without the high cost of fuel. It’s the most stylish hybrid compact sedan you’ll find in Sacramento. It’s the 2019 Honda Insight, and it’s available for sale right now at Mel Rapton Honda. Come check out our New Honda inventory today! *55 city/49 highway/52 combined mpg rating for LX and EX trims. 51 city/45 highway/48 combined mpg rating for the Touring trim. Based on 2019 EPA mileage ratings. Use for comparison purposes only. Your mileage will vary depending on driving conditions, how you drive and maintain your vehicle, battery-package/condition and other factors.